22 July 2016 – Dig Delve – An online magazine about gardens, landscape, growing & making. In the first summer after arriving here and with the space to do it, we planted a trial of 56 dahlias. It was, by chance, my mother’s recurring lucky number and one that she has handed down to me. The resulting show was cacophonous and for the next three years we kept it running, swapping out those that we didn’t like and adding in new varieties we wanted to try. Dahlia coccinea ‘Dixter’ is a survivor of only a handful that I have kept since the trial was dismantled to make way for the new garden. I may well return to having more again one day for cutting, but it is good to have a break and to only have the few I truly fell for. 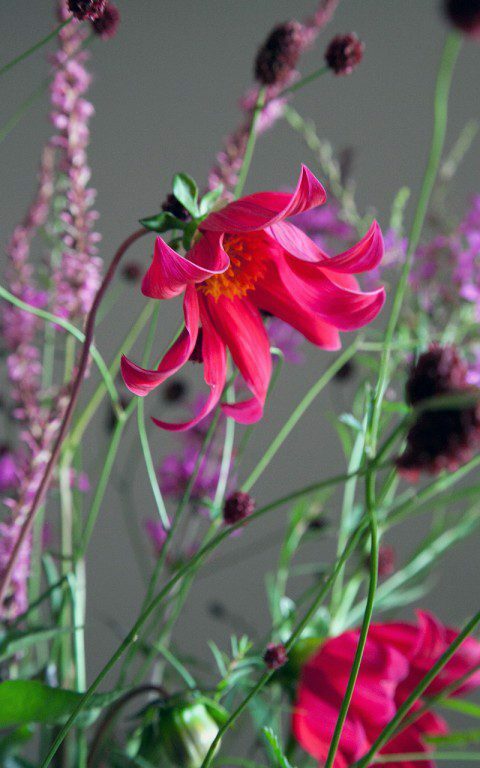 ‘Dixter’ is a beautiful plant, light enough in leaf to not overwhelm and standing at a sensible four feet to require the minimum of staking. 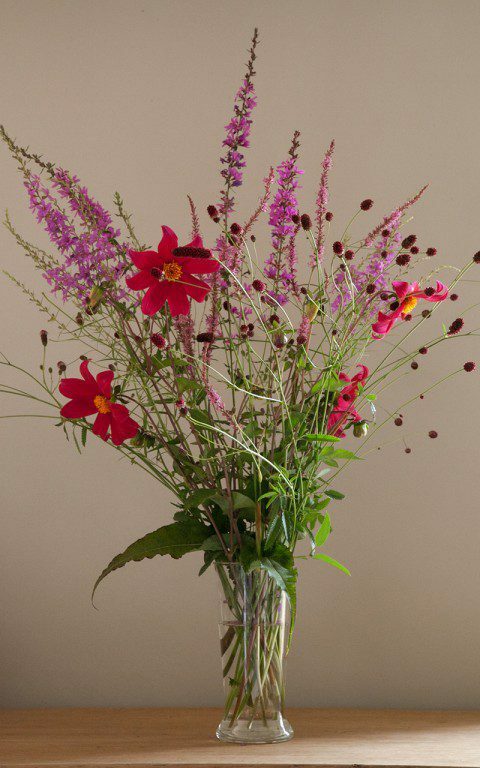 Its stems are long so it is good for cutting and, where I leave it in the ground to overwinter, it is up and flowering in June and continues with some deadheading until the first frost. I have failed to keep the true species, which is an electric tangerine, but it is on my list to have again, for the single dahlias are more easily accommodated into a perennial planting and help to prolong the summer. 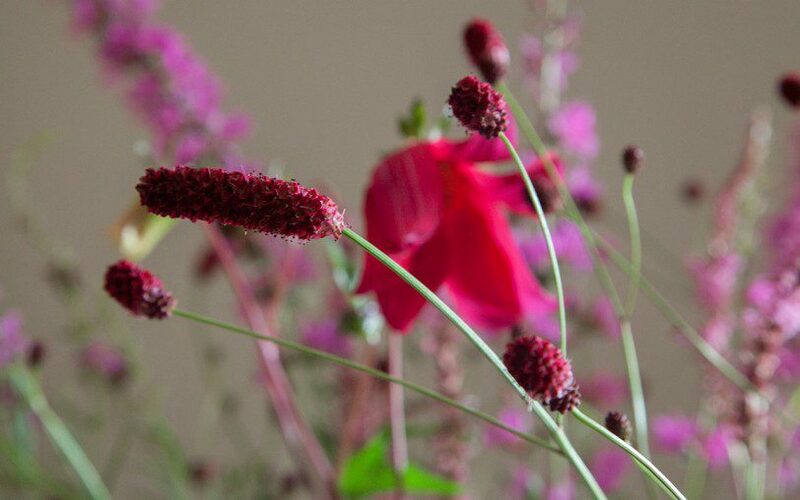 Here we have them with Sanguisorba officinalis ‘Morning Select’, the first burnet to flower here, and S. o. ‘Red Thunder’, which has the longer of the two drumsticks. 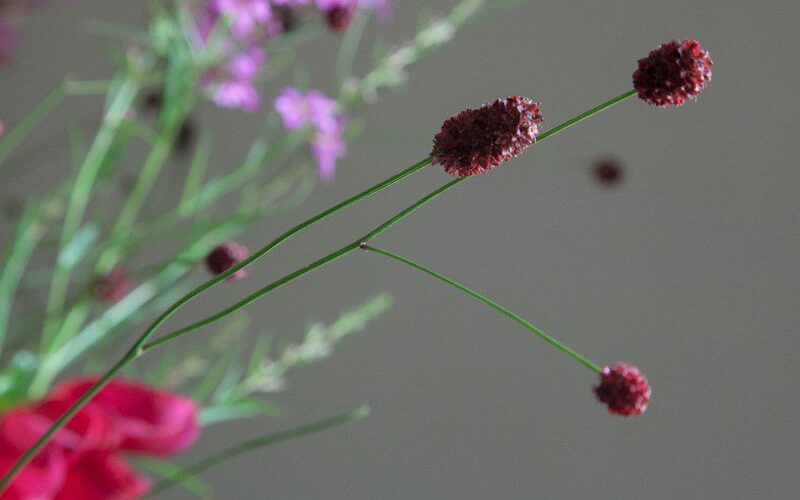 One day I hope to establish our native Sanguisorba officinalis in our damper areas of meadow and the burnets in the garden will be the weave between the two worlds. Happy on our retentive ground, they grow heartily here and I love them for the space between the multitude of thimbles. 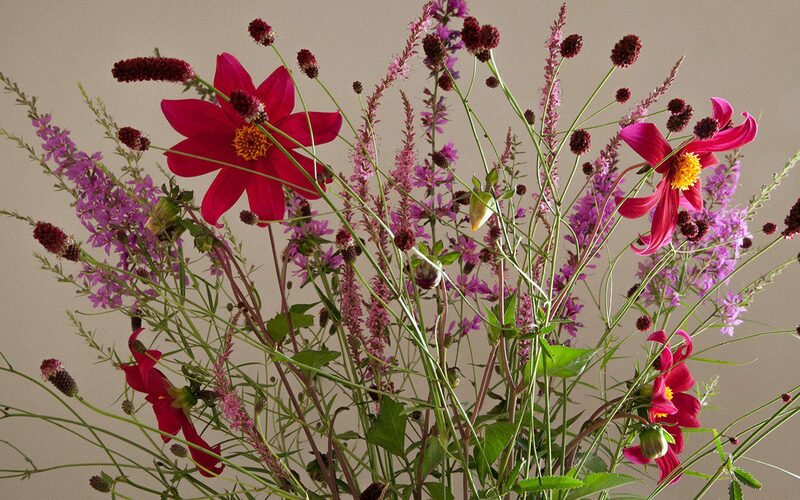 Other flowers, and indeed foliage, can sail into this cloud of colour in easy combination. Persicaria amplexicaulis ‘Rowden Gem’ is part of a trial of persicaria I have been running for the past couple of years. They are some of my favourite perennials for scoring a fine vertical. Starting to bloom now they continue until they are felled, like the dahlias, by the frost. They all have good foliage; an overlapping of elongated hearts, which is good from the moment it regenerates in the spring. They are long-lived clump formers, slowly colonising and only needing division every six to eight years, or not at all if you can find them a partner that can cope with the competition once they climax and join to form a colony. They are completely weed suppressing and are also happy in dappled light, where they will be rangy, or in full sun if the soil is not prone to drought. The lythrum are another good vertical. 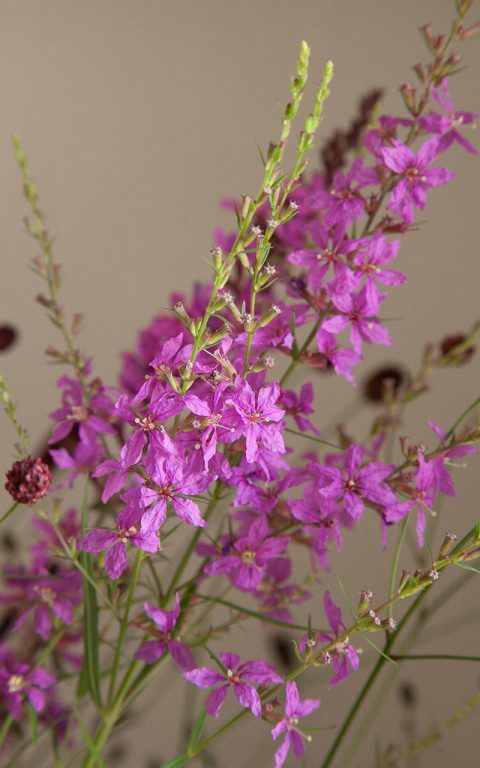 The bolder of the two here is Lythrum virgatum ‘Dropmore Purple’. I am not afraid of strong pinks and love the energy that happens when you team them with blue-greens. They can also take the sweetness out of lavender or mauve to make these softer colours work harder. 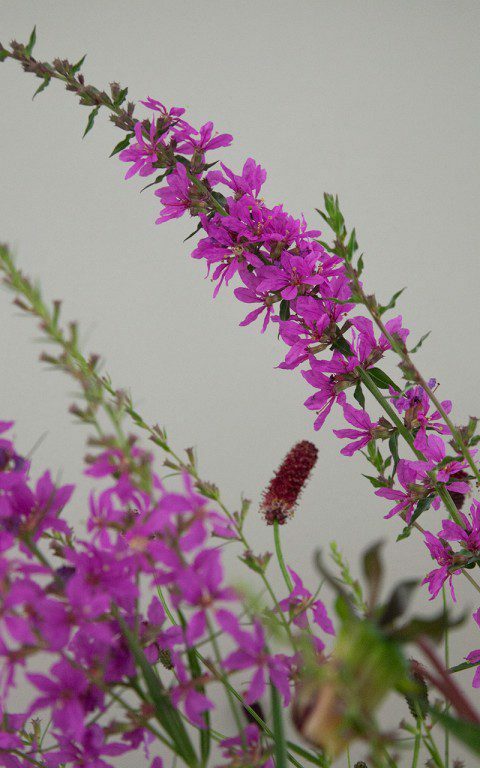 ‘Dropmore Purple’ hits hard with this strength of colour and more deeply than the native Purple Loosetrife, Lythrum salicaria. 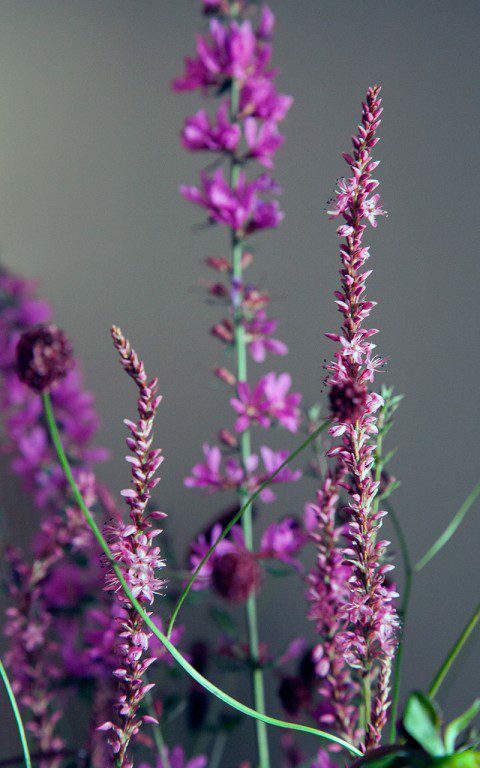 Lythrum salicaria ‘Swirl’ is a softer presence, with more open spikes, a finer habit and a less strident colour. Both are easy perennials, rising fast from a woody rosette in the spring and standing well into the autumn as brown skeletons once they have gone over. Though you nearly always see the native loosetrife punching chest high summer colour in wet margins, as garden plants they seem more than adaptable as long as the soil is reasonably retentive.